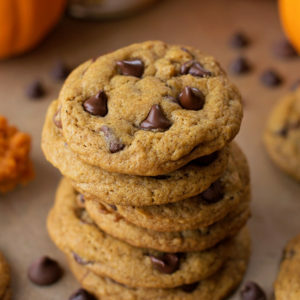 These crisp and chewy pumpkin chocolate chip cookies are far from cake-like! Thick, chewy and extra crispy... pumpkin cookies have never tasted so good! In a large mixing bowl of the bowl of a stand mixer, beat the melted or browned butter and sugars for 2 minutes on high. Add the vanilla extract, pumpkin puree and egg yolk, mix on low until just combined. In a medium size mixing bowl, whisk together flour, cornstarch, salt, baking soda, cinnamon and pumpkin pie spice. With mixing speed on low, gradually combine with the wet ingredients, mixing until a soft dough forms. Fold in the chocolate chips, cover the bowl with plastic wrap and refrigerate for 1 hour. Preheat oven to 350 degrees. Line a baking sheet with parchment paper or a baking mat. Scoop balls of dough using a standard size cookie scoop and place on the prepared baking sheet. Gently pat down each ball so that the tops are flat, press a few more chocolate chips in the top of each cookie. Place in the oven and bake for 10-12 minutes or until golden brown on the edges. The cookies will be slightly puffy but they will flatten as the cool. They will also look a little soft in the centers but should not be doughy! The longer you bake them the more crispy they will become. Remove from the oven and allow to cool for 5 minutes on the sheets before transferring to a wire rack to cool completely, about 5 additional minutes. -You can use all-purpose flour, but the bread flour makes these more dense, chewy and crispy. You can find bread flour in the bulk section of most grocery stores, just buy the amount you need, or it can be found in 5lb. bags in the baking section. -I've baked these at 375 degrees for 12 minutes and they were just as good! -If you prefer more spices, add an additional ½ tsp. of ground cinnamon and a ½ tsp. of pumpkin pie spice. -These cookies should be stored at room temperature for 2-3 days. Though they taste the best the day they are made- nice and crisp!